The global marine coatings market is consolidated with a handful of dominating players who account for significant shares of the market. These players are majorly leading in the market on account of their focus on development of products that are advanced as well as increasing their range so as to cater to specific demands of clients. The names of these players are: PPG Industries Inc., Akzo Nobel N.V., Jotun A/S, Chugoku Marine Paints Ltd., Sherwin-Williams Company, and Hempel A/S. According to Transparency Market Research (TMR), between 2017 and 2025, the global marine coatings market will expand at a 6.1% CAGR and reach a value of US$14.52 bn by 2025. On the basis of products, the market is led by the antifouling coatings as it offers solid protection from fouling organisms and slimes. In addition to this, an increase in maintenance and ship repair activities which require antifouling coatings will also boost the growth of the global marine coatings market. 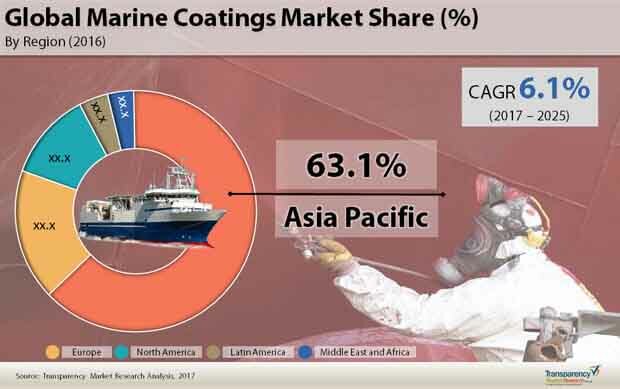 By geography, Asia Pacific is leading in the marine coatings market and it accounted for 60% of the total market in 2016, with China, South Korea, and Japan at the forefront. According to the lead analyst of the report, “the deep sea application of ships requires the ships and vessels to be protected against harsh weather conditions, while also maintaining their appearance and this is the major factor boosting the growth of the marine coatings market.” in addition to this, marine coatings play an important role in boosting the fuel efficiency of vessels. The rising ship repair and maintenance activities will also boost the demand for marine coatings during the forecast period. In order to ensure long-term security of marine assets, the oil and gas industry makes use of marine coatings extensively. The market is also supported through enforcement of norms such as the IMO ballast tank coating. It is anticipated that there will be product innovations in the near future as government policies are becoming strict and there will be a need to create eco-friendly products. Thus, manufacturers are focusing on developing metal-free antifouling coatings which has no negative impact on marine life or the environment. However, the slow growth of the shipbuilding industry is limiting the growth of the global marine coatings market. “Transparency Market Research is a next-generation market intelligence provider, offering fact-based solutions to business leaders, consultants, and strategy professionals. Our reports are single-point solutions for businesses to grow, evolve, and mature. Our real-time data collection methods along with ability to track more than one million high growth niche products are aligned with your aims. The detailed and proprietary statistical models used by our analysts offer insights for making right decision in the shortest span of time. For organizations that require specific but comprehensive information we offer customized solutions through adhoc reports. These requests are delivered with the perfect combination of right sense of fact-oriented problem solving methodologies and leveraging existing data repositories.